Early 2009, Qatar’s very own food and beverage specialists UNITED BUSINESS DEVELOPMENT launched their very first Indian Restaurant in Qatar. The idea was to create a fine dining establishment revolving around the enriching cultural experience of India and to cater to the ever-growing palates of the clientele in Doha. What started out as an amalgamation of modern and retro Indian cuisine quickly became one of the highly recognized award-winning restaurants in the country. At Saffron lounge one is sure to experience the diverse cuisine and culture of India with all its exotic flavours along with the utmost concern for your heath and spiritual well-being. 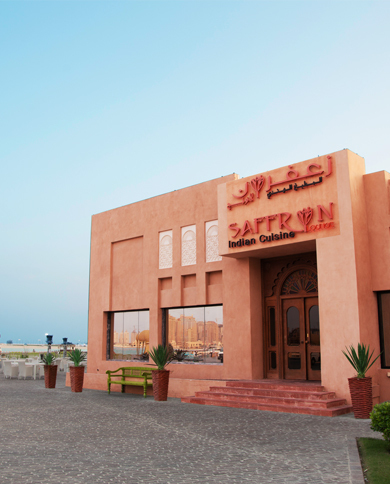 Located on the waterfront of the iconic Katara Cultural Village, Saffron Lounge’s hospitality, elegant ambience and authentic Indian foods are guaranteed to keep you coming back for more.